Seriously? OMG! WTF?Joey Fatone Archives - Seriously? OMG! WTF? Even with the sweet words, I wonder if this is JC Chasez, Chris Kirkpatrick, Joey Fatone, and Lance Bass’s way of testing out the waters of doing a reunion tour without Timberlake like the Spice Girls are doing one without Victoria Beckham. Would you go to see *SYNC if they hit the road together? To get a glimpse of what that would be like and see their performance from last night, then click here! On The Masked Singer, Joey Fatone revealed that he has 17 tattoos. Now he has 18 and the latest one is a tribute to the show. 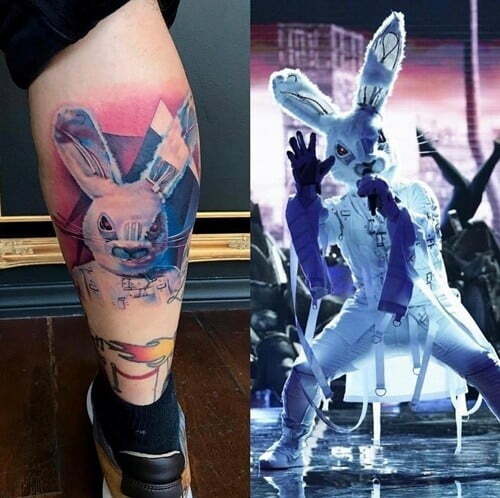 He got his rabbit persona inked on his calf. When he said the show made a difference in his life, he was not kidding. The only thing is that in a few years, people will ask him why he has a creepy rabbit on his leg because we will not remember that was his identity on some singing show where celebrities sang songs in a costume. There is a lot to watch tonight! There is a lot of good stuff to watch tonight and the night starts early, 5:30p exact That is when Joey Fatone tries his hand of hosting a game show on GSN. Common Knowledge asks 2 teams of three rounds of questions that should be common knowledge and the winning team goes home with $10,000. Sounds easy, but it is harder than you think. For the first round, each member guesses which of the multiple choices are the correct answer and they get more points for each member that gets it right. For the second round the whole team has to guess the answer as one. Thus, they get more points in this one, so anything can happen and anyone can win. Now it is time for the final round and they have to answer 7 answers correctly without getting one wrong. If they do it, they go home with 5 digits. If not, they go home with 0. Not only is Common Knowledge fun to play along with, it is also fun to watch Fatone hosting it. He is a natural born game show host. Then at 8p but over at Fox, The Resident is back. The episode picks up a little after the fall season finale. Conrad (Matt Czuchry) and Nic (Emily VanCamp) are running into the hospital to find out how his father is doing during emergency life-saving surgery. There is also still fallout around Chastain Park Memorial from Lane (Melina Kanakaredes) giving patients chemo treatment even though they did not need it. To make matters worse, she has just been released from jail for the murder of one of them. The first thing she does is visit Dr. Bell (Bruce Greenwood). He says that he is no longer going to help her and she blackmails him with something from his past. What is he going to do about it? Meanwhile, Devon (Manish Dayal) is dealing with the fallout of his own after calling off his wedding at the wedding because he has feelings for another woman. This is just a few of the lively moments from the episode where not everyone will make it to the end of the episode alive. Who dies and what ramifications will there be? Then at 9p, The Passage debuts on Fox about how the ultimate cure can kill us all. Project Noah has come up with a cure that can rid the World of all diseases or it can it wipe out the human race. They have been testing it out on adults, but some of them have been turning into vampire like creatures. Therefore, they need a child to do the test on. Amy Bellafonte (Saniyya Sidney), a young girl whose mother just died of a drug overdose and is now all alone in the World, is chosen as the subject. Project Noah hires Agent Brian Wolgast (Mark-Paul Gosselaar) to protect her. He lost a child of his own and feels a bond with Amy. Thus, he cannot let her be a test subject, and tries to do everything he can to protect her. Even if it means risking his own life. He is on the run all by himself and Project Noah is using their best people to capture them. Can he save this girl that might the answer to all of our diseases or will they be caught and end the World? Each week, we will watch the two people who could save the World try to save themselves. All while learning what happens when we try to play Gd as we see the effects the cure has had on past test subjects. Then at 10p, The Good Doctor is back on ABC. The episode picks up exactly where it left off with an unknown virus quarantining some of the doctors in the ER. Shaun Murphy (Freddie Highmore) is on the floor distracted by the sound of a buzzing lightbulb. Morgan (Fiona Gubelmann) is operating on a man’s bowel and needs his help. She cannot talk him out of it because she is busy with her hands in a man’s body, but she will try. While they are doing that, Alex (Will Yun Lee) is watching his teenage son suffer an asthma attack from outside the ER and he cannot get in. Eventually, he breaks in and saves his son and calms Shaun down. That will last for just a few minutes because the virus is taking its toll on Allegra (Tamlyn Tomita). If they don’t figure out what the virus is soon, she will die. With death comes birth as Shaun and Morgan prepare to deliver a baby to a woman who is only 36 weeks along. Talk about getting a whole year of medical school in just one day. That is what they get, we get to watch it all and find out who will get out of there alive. Someone has to or we will not have a show. Talking about life and death, Dr. Glassman (Richard Schiff) will find out if he still has cancer. Shaun was supposed to take him, so Lea (Paige Spara) has taken him instead. He is expecting the worse, and Lea asks him all about his disease. It is good for him to be with someone who is not a doctor who can help him look at the patient side of life. How will their wait together change both of their lives? That is if he has one. It is an intense episode but shows why this show was last year’s break out it hit. Do teens know who *NSYNC is? Back at the turn of the century, every teen could tell you who was who in *NSYNC. Can teenagers today, who were not born when they were together as a band, tell you who is Joey Fatone and who is Justin Timberlake? Nope. FBE asked teens what they thought of *NSYNC, the BTS of their time, and they barely knew who they were. That is going to hurt on so many levels. One for the band because their notoriety is bye, bye, bye. Then there are the fans who are going to feel old because kids that are the same as age as they were when they were into the boy band, can’t tell you the members of the band are. What is even sadder for Joey, Justin, Lance, JC and Chris, the teens did a better job when they were asked about Backstreet Boys. I guess the latter are still larger than life. Even though *NSYNC was the biggest boy band for their time, they did not live the lifestyle that other rockers would have in their position. That is at least according to what they told Ellen DeGeneres when they played Never Have I on her show today. The daytime talk show host asked them several questions about hooking up and they really did not do anything interesting. 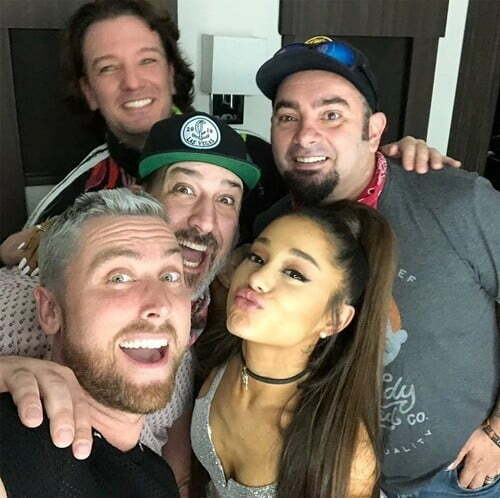 You would, think Justin Timberlake would have have done everything, but it was really Joey Fatone and Chris Kirkpatrick who lived like rock stars. Which is sad because let’s be honest, they are the least hottest of the band. Although, I think Fatone has the best personality of the bunch. JC Chasez might have been my favorite back them, but now I am all about the FatOne. Who is your favorite?